“Walter McClusky—I just called him Walt—was a big, strong man who stood over six foot five,” Ben began. “No one ever doubted his ability to handle himself in the wild. 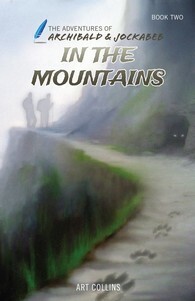 He knew these mountains like the back of his hand, havin’ hiked and hunted in them for years. His aim was deadly accurate whenever he shot a rifle, drew back a bow, or hurled his favorite bowie knife through the air. He was one tough mountain man, that’s for sure. “One winter Walt was attacked by a grizzly, and he wrestled that bear to the ground and finished it off with a few swipes of his knife. He’d also been jumped one time by a mountain lion, and Walt snapped its neck as if it were a twig! Everyone knew Walt was a man who could take care of himself, which made the circumstances surroundin’ his death even harder to understand. “You see, Gran thought her husband died of a heart attack on a huntin’ trip. That’s what I told her after I found his body a few years back—or what was left of it, I should say. I didn’t have the heart to tell her what really happened, or to let her see his remains. After the two brothers had crossed their hearts and swore they’d never tell a soul, Ben continued his gory saga. “When Walt didn’t come home for dinner one evenin’, Gran wasn’t too worried because she knew her husband sometimes like to stay overnight in the mountains he loved so much. But when he didn’t show up by the next night, she started to fret and sent me out to look for him. “I headed up this direction and searched for the better part of the day, but Paul Hornung Authentic Jersey didn’t find a trace of him. And then, just when I was about to quit and start back to camp, I came upon his body. It wasn’t far from the ridge we just left, and what I saw wasn’t a pretty sight. I won’t go into all the gory details, but let’s just say his body was pretty torn up and missin’ an arm and leg. As I told you earlier, I gathered up Walt’s remains and headed straight to town to see Mr. Crane. “When I saw Gran, I just told her that he’d collapsed out in the woods and passed away, and that it must have been a stroke or heart attack, and that I’d taken him straight to the mortuary. She seemed to accept that explanation, and said she didn’t want to see his body—she just wanted to remember him as he was when he was alive. Oh, there’s one more thing . . . ” He paused and looked grimly at the boys. The hikers continued their way toward Camp Bear Claw. Their progress was slowed by the rain-slicked path. Jockabeb dropped behind Ben and Archibald, who’d disappeared around a sharp bend in the trail, when he suddenly sensed movement out of the corner of his eye. Glancing abruptly to his left, he slipped, and losing his balance, fell backward. When he hit the ground, his head struck a rock, and instantly all he could see were stars! Lying flat on his back, Jockabeb wiped his brow and slowly opened his eyes. Light-headed and with blurry vision, he gasped at the sight of a large, dark shape sitting directly above him on a mammoth boulder. Through a semiconscious haze, he stared up at the grotesque black head and straight into a pair of poison-yellow eyes. Defenseless, he recoiled as the black beast suddenly opened its mouth wide and began to lick its sharp white fangs. Letting out a savage scream, the dark creature prepared to pounce. But when it heard the sound of footsteps rapidly approaching, it withdrew behind the boulder. Seconds later, Ben and Archibald ran around the bend and saw Jockabeb lying motionless with his eyes fixed on the large boulder directly in front of him. Ben immediately thought the boy might be in shock. Archibald placed a hand on his brother’s clammy forehead and anxiously asked, “Jockabeb, are you alright? What was that wild scream? What happened? Jockabeb, can you hear me?” Unable to answer, Jockabeb’s eyes fluttered shut as he passed out.